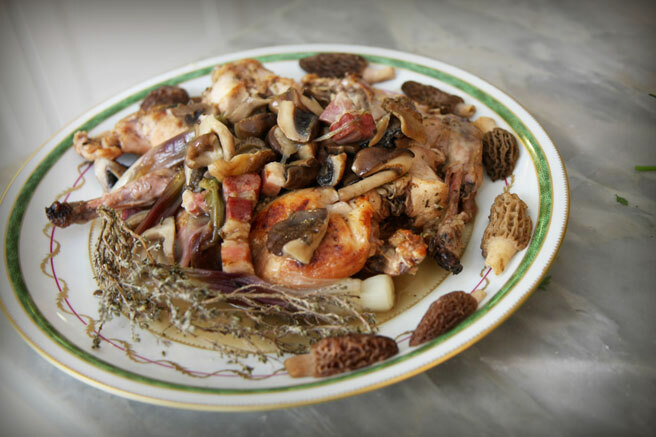 It's rabbit season, and in addition to terrines, ballotines and rables de lapereaux farcis, I also like to make use of the varieties of wild mushrooms we're catching at the moment with a lapin en gibelotte. It's one of those white wine fricassees and you can find a version of it in just about all housekeeper's companions. This dish is exquisite in Autumn when the volailler puts the wild rabbits out, and when I make this with game animals, I replace the salt pork with smoked poitrine. It is still great way to cook any big farm rabbit you can get. When using farm rabbits, the flavor I find is more balanced with either salt pork or fresh poitrine, try it and make your decision. - Cut the salt pork into cubes, and bring them to a boil in 2 cups of water. Drain and pat dry. - Peel and parboil the onions. Set aside. - Heat the butter in a saute pan large enough to give the rabbit pieces room. Add the salt pork and the onions, and let that cook for about 3 minutes, shaking and stirring. When they are browned, add the mushrooms and and cook over high heat for 5 more minutes. Strain, reserving the liquid, and set aside. - In the same buttered saute pan, to which you can add a little more fresh butter, if necessary, saute the rabbit (minus its liver), seasoning with salt, pepper, thyme and bay which you have ground in a spice grinder. - Sprinkle the flour over this when it is sufficiently brown, and cook for another 3 to 4 minutes, letting it further brown. - Sprinkle crushed garlic over that, and then add the wine, agitating to allow it to absorb the flour. Add water if necessary to make sure the rabbit is covered at least halfway. - Add the bouquet garni, then simmer in the oven (200C/400F) for 30 minutes. - At the end of this simmering period, add the salt pork, onions and mushrooms, and simmer for another 25 minutes. 5 minutes before stopping the cooking, add the liver and parsley. - If at the end of cooking, the sauce has not reduced to your liking, remove the rabbit (keeping it warm) and transfer the sauce to a smaller pan, then simmer over high heat to evaporate the liquid and concentrate it. I can't see a single post with pictures you'd like to bury. but it's true that this one is especially gorgeous. ps. glad the croissant turned out ok! They are morels! You must come visit! What happens to the minced parsley? It's in the list of ingredients but there is nothing in the instructions to say what to do with it. From the photo, it doesn't look like it's used as a garnish. I have tried this twice and both times the rabbit has come out tough. Old rabbits? Hello Anonymous, I have put where to add the parsley in the recipe thanks to your kind comment. I'm sorry, I cannot advise about why your rabbit is coming out tough, there could be many factors, from the age and source of the rabbit to the cooking time not being sufficient for your particular rabbit. Why not try cooking it a little bit longer? If that doesn't work, then I'd go to the source where you got the rabbit and ask them.